Mardi Gras in the Mountains – Vermont’s best fest! When I heard about an amended version of Mardi Gras in Burlington, Vermont, my curiosity was piqued. How could the Green Mountain State’s most cosmopolitan city pull off a family-oriented Mardi Gras event so far north of the Mason Dixon line? Since the Bourbon Street affair has no appeal to me, I decided to check it out this northern adaptation. The annual Louisiana Mardi Gras festival has earned a hedonistic reputation of attracting thousands of belligerent partiers, who crowd the French Quarters in pursuit of beads—which are rewarded for mischievous behavior. Perhaps Vermont would offer a more wholesome event than its New Orleans original. The cold weather surely would alter one “Fat Tuesday” tradition. It had been a particularly snowy winter, so I was keen on a trip to the winter wonderland of Vermont. If nothing else, it was a good excuse for a February weekend of skiing. Besides, the festival has received accolades including the 10 Best Vermont Winter Events. The Mardi Gras event is sponsored by the local brew company, Magic Hat. “In Vermont, Magic Hat is to beer what Ben & Jerry’s is to ice cream,” I was told. Arriving in Burlington’s heart and soul of Church Street Marketplace, a pedestrian zone full of shops and restaurants, we immediately sensed the fun festive vibe of this lakeside college town. Pubs and ethnic cafes dot the brick lined city center, with great causal dinner options, funky boutiques to browse and several nightclubs brimming with live bands and music. Saturday morning, we chose the easy 20-minute drive to Bolton Valley for some downhill skiing prior to the afternoon Mardi Gras parade. Burlington is less than a fifty-minute drive to several of the East’s finest ski areas—Bolton Valley, Stowe, Smugglers’ Notch, and Sugarbush. Even with perfect conditions and a fresh layer of powder, we were among only a handful of weekend skiers at Bolton. This unassuming family area is home to an assortment of old double chairs and one quad. The straightforward layout made for a delightful morning of sliding surrounded by outstanding views of Lake Champlain, the snow-covered Green Mountains and the distant Adirondacks. We cruised scenic Interstate 89 back to Burlington in time for the main event, the Mardi Gras parade. The warmly dressed multitudes eagerly awaiting the floats spanned all age categories. Three dozen lively floats passed us by, small potatoes compared to the New Orleans variety, but extremely entertaining and much more up close and personal. Burlington showed it true colors, quite colorful for a small city, with everything from drag queens, to peaceful protestors, skiers and dancers, clowns and Catamounts from the University of Vermont. Some floats looked like they were thrown together over a six-pack, while others clearly involved more than a rummage through the attic. The sea of colored beads tossed from each float meant that every kid scored a collection of the authentic necklaces. This was proof of the promised family atmosphere, no raunchy conduct required to earn beads. I caught a few strands myself, but was particularly excited about snatching some generously donated Lake Champlain Chocolate truffles and a delicious Moon Pie. As the animated parade wound its way to Church Street’s end, a Block Party with live music started up. The chill of the afternoon winter air did not keep the zealous Vermonters from dancing in the streets, sipping Magic Hat beer, though many opted for steamy Green Mountain coffee. I enjoyed the parade and party so much; I decided to wear my beads skiing the following day. Stowe was the obvious choice, given its much-deserved reputation as “The Ski Capital of the East.” The nation’s top ski publications consistently rank Stowe #1 in the East. All morning, we alternated between the high-speed quad and the eight-passenger gondola, carving up the brochure quality snow on legendary trails like Gondolier and Perry Merrill. We had to ski Stowe’s famed Front Four trails—known throughout New England as some of the steepest, most challenging terrain. National and Liftline are certainly steep, but Goat and Starr are still more precipitous and narrower. In fact, these paths are not accessible to the grooming fleet, and certainly not recommended to any but the most advanced skier. At lunchtime we discovered another superior eatery, this one high atop Mt. Mansfield and reached only by gondola. It is located at the base of a sheer wall of granite, and aptly named The Cliff House. We selected from a gourmet menu of cheesy fondue, creative homemade < soups, sandwiches and salads, and the alpine view is always on the appetizing menu. As a fortuitous end to our weekend, we were snowed-in Sunday night. That would never happen in New Orleans! And what better place to be held captive than the postcard perfect town of Stowe during a good ol’ fashion New England blizzard? We gleefully hid away from the real world for an extra night at the classic and well appointed Green Mountain Inn. Skip New Orleans, head to Vermont for a new twist on Mardi Gras. You will grab plenty of beads, and get fresh tracks at Stowe, Smuggs, Jay, Sugarbush or Bolton. The Hilton Hotel is the place to stay. Ideally located on the waterfront, especially enjoyable with a Lakeview room. It’s a short walk to Church Street’s four-block pedestrian zone through an enclosed Mall of popular shops. 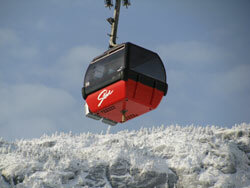 Stowe Mountain Resort encompasses some of the east’s finest skiing on Vermont’s highest peak at 4, 395’. 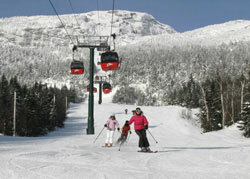 Smugglers Notch is just 35 minutes from Burlington, rated #1 family ski resort in the Norhteast! Bolton Valley, just a half hour from Burlington, offers un-crowded skiing and riding, plus night skiing. 1-877-926-5866.